Italdesign Giugiaro co-founder Giorgetto Giugiaro says the deal with HK Motors reminds him of the company's first contract in 1968 with Alfa Romeo. MONTGOMERY, Alabama -- Italdesign Giugiaro S.p.A. foresees no problems managing the largest order in its 42-year history: a 375 million euro contract to provide complete design and engineering for eight new models for U.S.-based, Chinese-backed startup automaker Hybrid Kinetic Motors Corp.
“We normally manage up to 10 complete engineering programs a year,” said Enzo Pacella, Italdesign CEO. The contract with HK Motors calls for eight vehicles based on a common, flexible platform to be designed by Italdesign. The cars will share a common powertrain. Pacella sees the HK Motors deal as being much easier to manage than eight different projects for eight automakers. As part of that deal, Italdesign also designed and engineered Alfa's assembly plant in Pomigliano d'Arco, near Naples, central Italy. Giorgetto Giugiaro is arguably the premier automotive designer of the past century. He began his career in September 1955 at Fiat. Since then he has designed more than 150 production cars and about 100 concept cars. Italdesign currently has 975 employees and 800 computer-aided design work stations, mainly based in its headquarters in Moncalieri, 10 miles south of Turin. Its design work is often made public by its automaker clients, but its engineering work typically remains confidential under terms of its contracts. 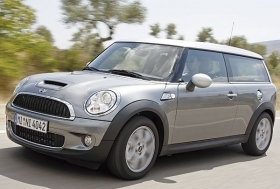 Italdesign Giugiaro did the engineering on BMW's second-generation Mini range, which includes the Clubman (shown). In the past eight years, the only engineering tasks that Italdesign has been allowed to take public credit for are its work on the Citroen C3 Pluriel cabriolet and the model range for BMW's second-generation Mini, which includes a hatchback, convertible and Clubman station wagon. The engineering work for HK Motors will take the next four years, Pacella said. After that, Italdesign will provide on-site assistance for the start of vehicle production, which means the contract will run until 2017 or 2018. HK Motors' technical details are still sketchy, but the company said it aims for carbon dioxide emissions of less than 50 grams per kilometer by combing its hybrid powertrain with a 1.5-liter turbocharged engine that runs on gasoline or compressed natural gas.